All homes have both good and not so good features. Here are tips to bring out the best features of yours! No matter how dated or un-decorated, every home that I’ve ever been in is, I can always find a few features that are awesome and others that are well…not so much. The idea is to minimize the features that don’t make your home shine in the best light and maximize the ones that do! 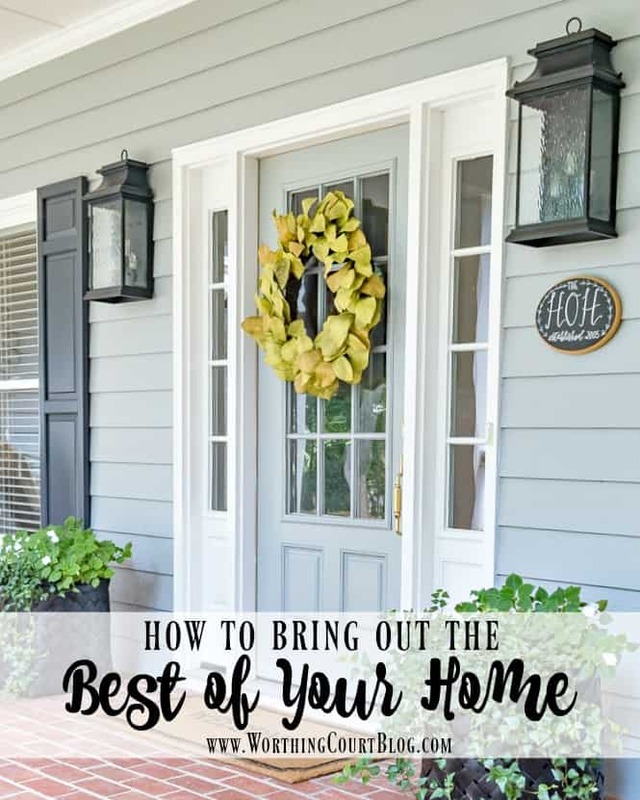 Check out these tips for how to bring out the best of your home, so that it will always put its best foot forward. 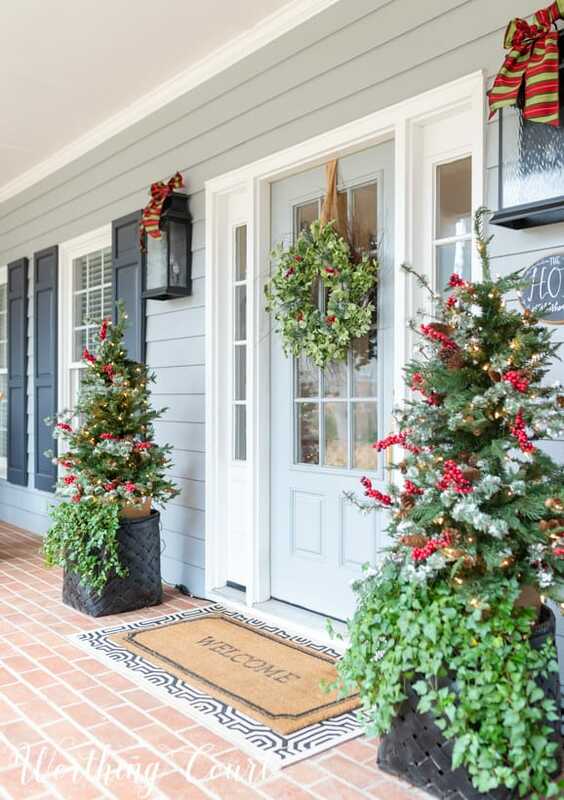 Obviously, the exterior is the very first thing that someone sees when they arrive at your home. It will be THE thing that either makes a good first impression or a less than stellar one. 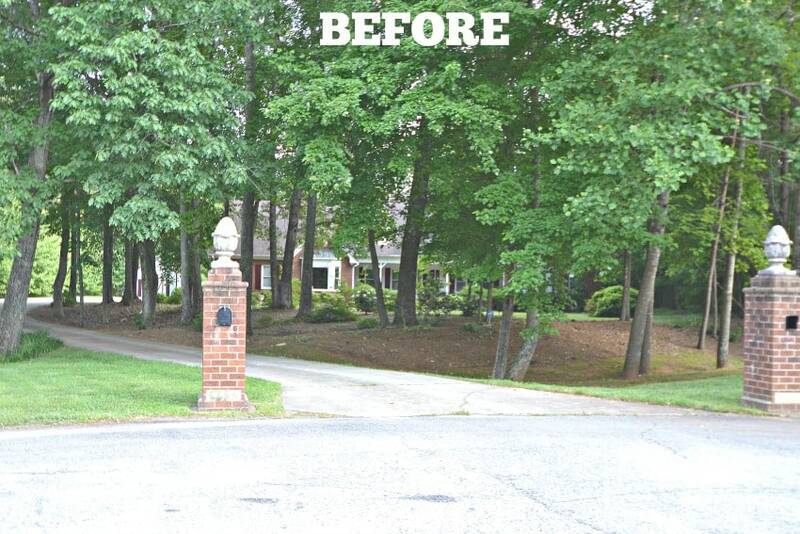 Our house is a good example of what a difference improving curb appeal can make. The landscaping was a hot mess when we first purchased it. You could barely see the house from the street because the limbs on the large trees had been allowed to grow so low on the trunks. To make matters worse, the twenty year old landscaping, that was around the foundation of the house, was majorly overgrown. There’s still more landscaping to do (this year, I hope! ), but today, we’ve limbed-up all of those huge trees and pulled out all of the overgrown landscaping. The house got a new roof (thanks to insurance coverage for hail damage) and new gutters, we beefed up the front columns (the old ones looked like toothpicks holding up the porch roof! ), removed the diagonal supports from the columns and even gave the brick itself two coats of paint. All of our windows are just one big pane of glass, which makes them look cold and uninviting to me. An easy fix for that was to add window grids to the interior of each window. It was a very affordable project and so easy to do!. Click HERE for the details, if this is something you think you might like to do to your windows. The original front door was mahogany with oval glass and we replaced it with a more modern farmhouse door and updated the outdoor wall sconces. 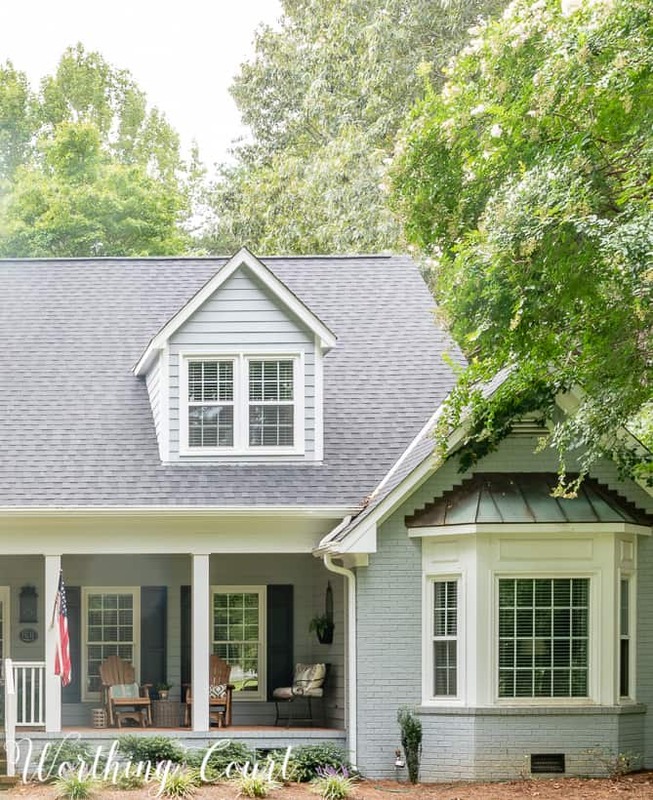 You certainly don’t have to go to this much trouble or expense, but anything you can do to tidy up and freshen your home’s exterior is a plus! Many rooms have a ready-made focal point already in place, such as a fireplace or a beautiful view through a window. 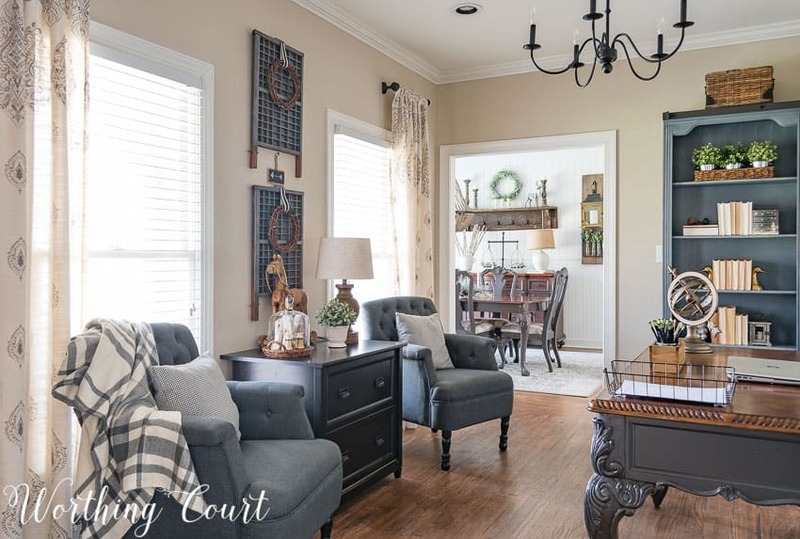 If your room doesn’t have a built-in focal point, then you can create one by strategically placing art, or with the furniture arrangement, or by adding pops of colors and so on. In fact, I wrote a whole blog post about focal points and you can find it by clicking right HERE. Some rooms have more than one focal point and that can create another kind of problem. In that instance, you want to draw your visitor’s eye toward the one that you most want to stand out. I have multiple focal points in my family room – one is the fireplace and vaulted ceiling, but the other is a large entertainment center holding our huge tv. The huge tv is the one that I don’t want to draw attention to! 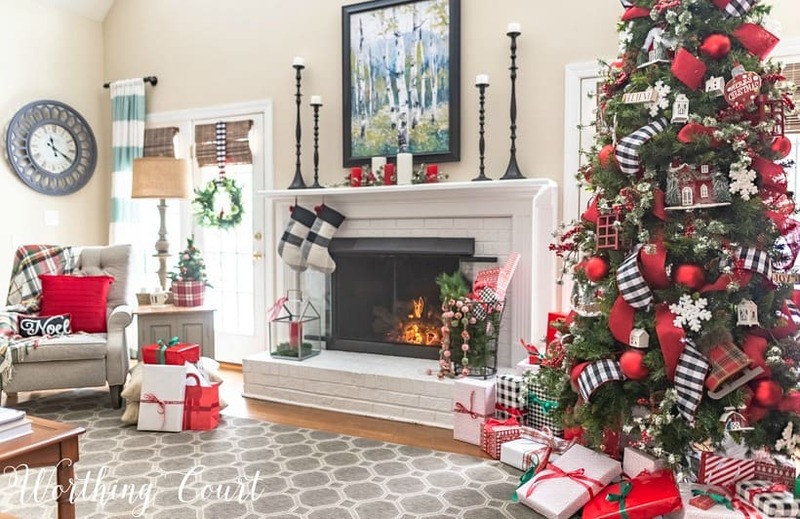 I made an extra effort to draw the eye to the fireplace and the height of the ceiling by hanging tall, over-sized wall decor above it. As a result, that’s where everyone’s eye goes, no matter which doorway they enter my family room through. One of our bedrooms is a good example of a room where there really wasn’t a good focal point, so we needed to create one. Yes, the bay window is a nice feature, but it really doesn’t draw your eye like a focal point should. My solution was to add board and batten to the large wall where the bed resides. It makes quite the statement! We’ve completely remodeled our whole house, but I’ve been going through room-by-room to put the finishing touches on each one. There are multiple rooms with walls that pretty much had zero interest until I added texture. Now each of these walls is a real feature! Our foyer has a wall with a large opening that leads into the home office. Because of how the front door opens and because of the placement of another opening, I wasn’t able to add anything of a substantial size to make the wall less boring. I could have hung artwork on either side of the opening, but that would have been too matchey-matchey for me. My solution was to add a board and batten treatment and dress it up with hooks that are fun to dress up for the different seasons and holidays. I built those matching benches too! You can get the step-by-step tutorial for those by clicking HERE. Our dining room had a long, boring, blank wall that still had a lot of bare space even when I placed my buffet against it. My solution? I dressed the wall with a super easy planked wall treatment, then topped it with a large vintage shelf and a pair of diy hanging lantern displays. Want to make a hanging lantern display for your home? You can get that tutorial right HERE. Maybe you don’t think a room has any sort of feature that you consider a plus. More than likely, it at least has one window though. Did you know that window treatments are the jewelry of a room? A pair of simple draperies, flanking a window can be the very thing to give an entire room a special feel. The windows in our office were too close together to hang a pair of draperies on each window (plus they would have blocked a lot of the natural light), so I chose to hang one drapery panel on each window instead. The pair of draperies serve to “frame” the whole wall and turn it into a feature. What’s your homes best feature? Have you taken any steps to highlight it? Your ideas are terrific. I love what you have done to your home. Your home is so pretty!.. and Wow! What a difference you made to the exterior too! We are moving into our “fixer upper” in a little less than 2 weeks (Yay!!?) and I can’t wait to get my hands on it to bring out its hidden beauty. It’s a 3600 sq ft red brick behemoth with SOOO much potential. 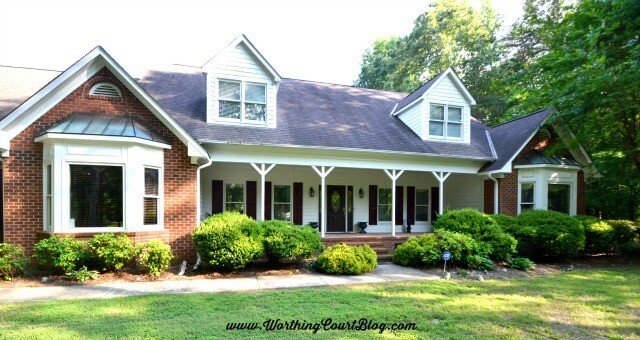 The exterior is surprisingly similar to your before picture (red brick, white siding, and dark blue/black shutters)… but I would LOVE to give it the look your “after” picture has! Just found these paint colors! Yay!!! Thanks so much!!! Wonderful ideas! I love your home – inside & out. I love the frame the window idea. I will have to think about that in my own home. 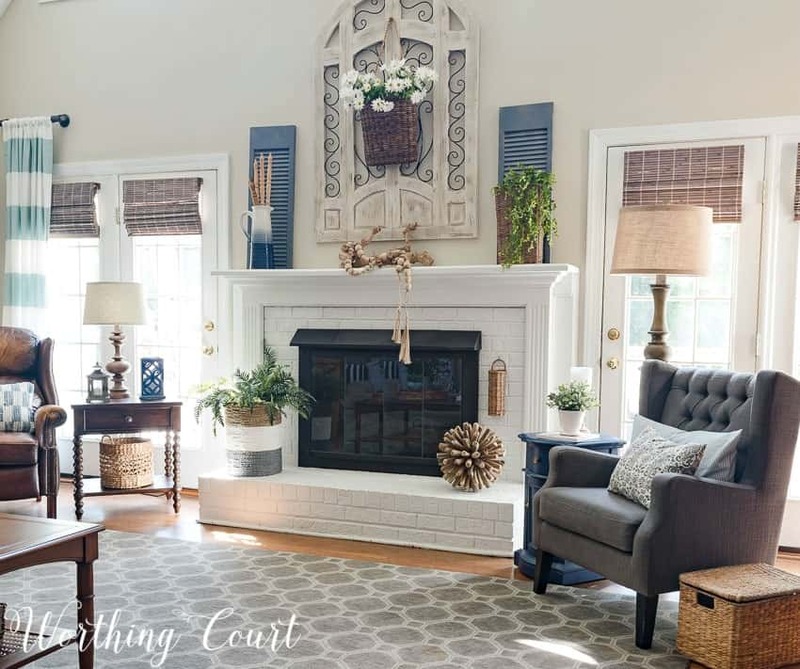 You will probably think that I am crazy with SO MANY wonderful things in your home to comment on, but I was inspired by how you put a twig wreath between the white wooden candlesticks and the boxwood balls on the sideboard in your living room. Stroke of genius! It is so inspiring to read your blog. Thank you for all the wonderful ideas. This is such good advice Suzy, and true for everything really, focus on the positive and ignore the rest that we cannot change. Thank you so much! Great ideas here, Suzy! Your sideboard decor really inspires me… and I love the technique you used to paint it! Surprisingly good!It’s very creative and beautiful. 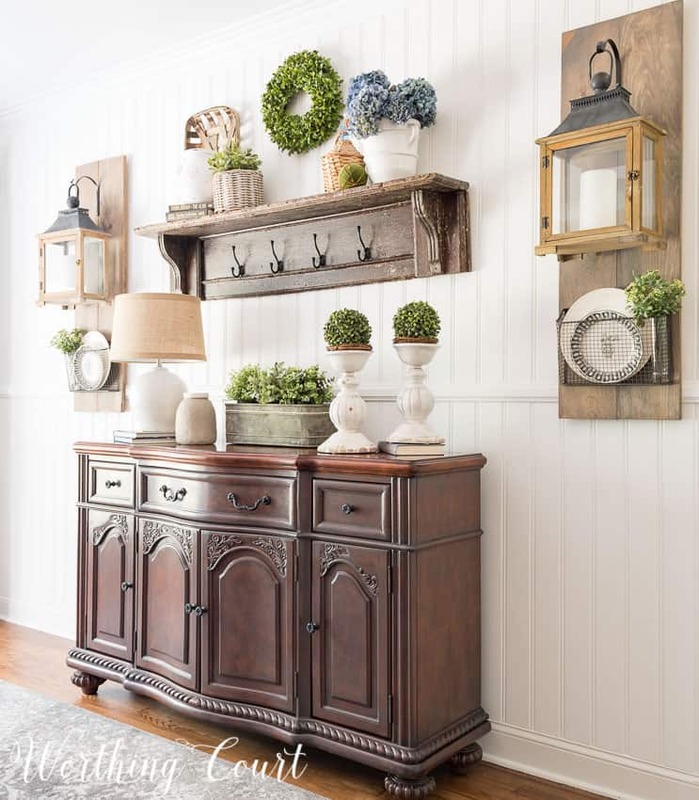 This sideboard has an antique look. It’s Look Excellent for your home . You have me rethinking what I have above my fireplace. I thought it look great, but after reading focal point I’m wondering if I need to change out my decor. Hmmm! Great ideas for decorating each room around a focal point. 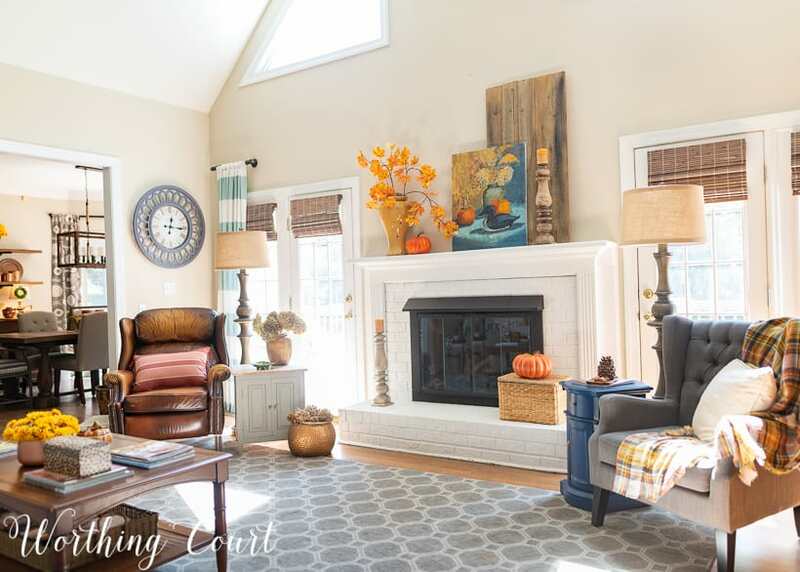 I like your idea of taking the focus off of the large TV in the family room, by creating an even grander focal point above the fireplace to enhance the ceiling height and draw the eye up. Talk about creating drama! Thanks for sharing! This is one of the best blogs ever. I gained a lot from these ideas. Very practical and useable. Love your ideas! Great information. Thank you! I always get great ideas from you. Thanks! Love the fireplace. Neat and such a clean look. I have to get the fall stuff together but not quite ready to give up summer yet. Thanks for inspiring me. Great post! I love the planked wall in your dining room. My dining room is small but does have that one big blank wall that would benefit from having the white planked look. Great ideas! So many things I love about your house decor. Suzy is so knowledgable and has such an eye for decor! I’m so new at decorating and it’s intimidating to me but she makes me want to bake an apple pie and sit down and talk with her for hours about the possibilities of my space! She is so fabulous! Thank you for all the fabulous ideas you share. You are inspiring me to think out of the boring box! Very helpful tips. Your description of your yard when you first moved into your home sounds a lot like my house until this summer. The front of our house could barely be seen because of overgrown shrubs and trees. What a difference after some of that growth was removed! We are moving into a (new to us) older home. Needs lots of updating. Your site is very helpful! Your pictures are very inspiring! You have the best ideas! 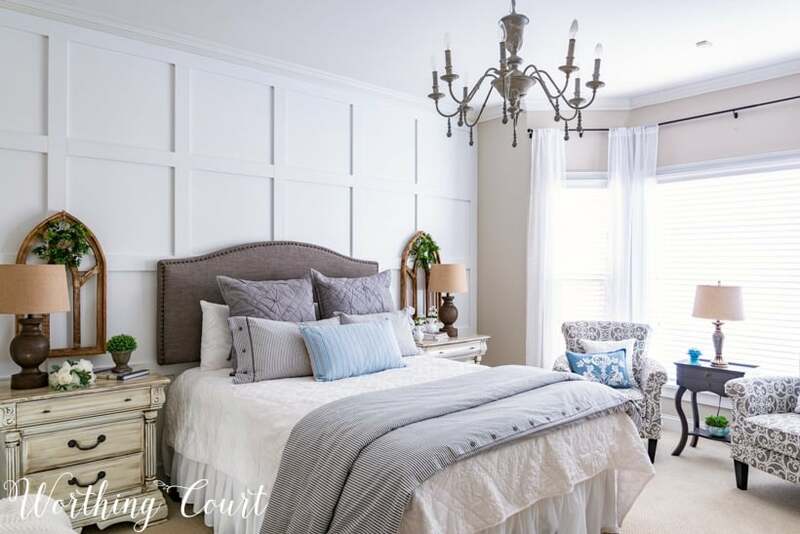 I love the board and batten wall! The Ideas on how to bring out the best of your home are excellent. 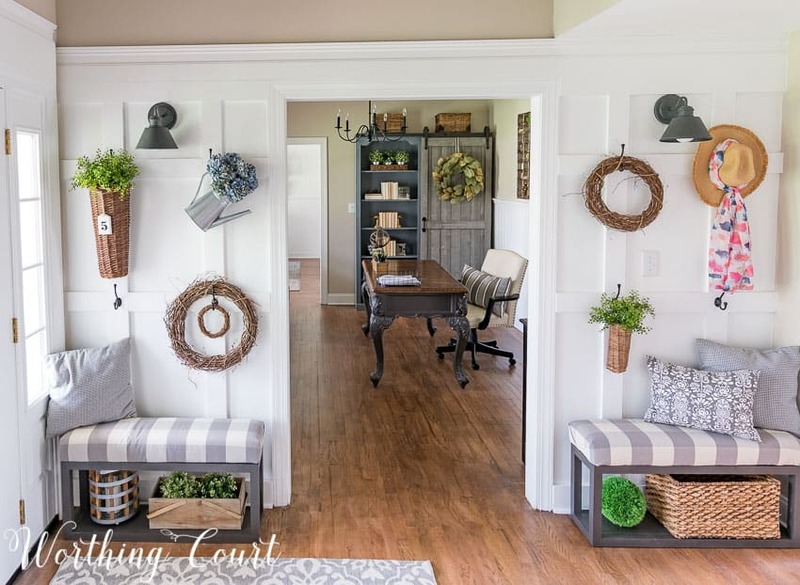 We all want our home to be inviting and Suzy accomplishes this beautifully. I am inspired to work on the exterior of our home. Thanks for the principles and the “how” to make our homes beautiful! Great ideas and tips! I love your front door and the way it fits your home perfectly. You are always so inspiring! You have inspired me to start using more pillows on our couch and bed.!! We temporarily have a tiny rental home while we house hunt this year. So would it work best to have a medium size basket to store them in the livingroom even though my space is quite limited right now or should I just find a corner of the room to place them when we watch a movie or have company over?